Home » Comics Reviews » Jim Henson’s Labyrinth: Coronation #1 Review! Jim Henson’s Labyrinth: Coronation #1 Review! Labyrinth (1986) was the second fantasy film by Jim Henson which was just became a fan favorite over the years. The film returns for a fan celebration returning to theaters in April 29, May 1 and 2nd. Boom Studios imprint, Archaia, had the Labyrinth special on November of last year. 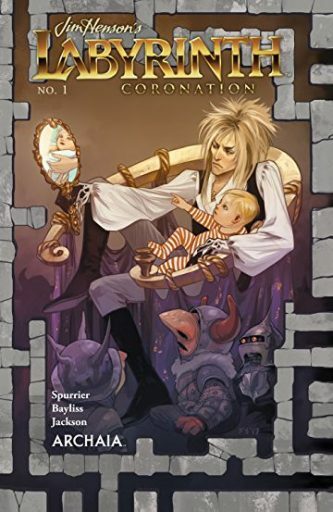 The cover to the comic is by Fiona Staples with Goblin King Jareth holding baby Toby while looking into a mirror. It is bordered by a maze of labyrinth walls. The story is by Simon Spurrier who is wrapping up Power of the Dark Crystal for Archaia/Boom Studios. The art is by Daniel Bayliss who also worked on Boom’s Big Trouble in Little China/Escape From New York limited series. His artwork is light and cartoony almost like manga, but very fun. It opens with Sarah trapped in the Oubliette, her arm outstretched as we see the Helping Hands. Then, we see her face distorted in Jareth’s crystal sphere, a goblin says, “She’ll never give up”, and finally a closeup of Jareth’s eyes. Then, we get a full look at Jareth’s goblin court laughing. This is a good twist on what was seen in the movie. The goblin, Beetleglum, lurks away and Jareth is angry at him for not watching over Toby. He picks up Toby who tries to grab for a stuffie of a winged lion while Jareth tells him the tale of “an unvanquished heart.” His story flashes back to the Republic of Venice, 1797 in a ballroom similar to the one that traps Sarah. It also has a banner with a winged lion. A masked count and countess are dancing. Jareth tells the story interrupted by Beetleglum. The countess, Maria, later is painting mermaids when an attendant tells her she should be painting the roses that are in front of her. They remove their masks, the count looks like Jareth, blond hair with a pony tail, and he goes to talk with constables. In a two page spread, cleverly constructed, we see the count, Albert, walking to his room, with the goblins whispering, tempting him off the side panels, and in a chair Albert struggles until Maria checks on him. She asks about the monsters and another clever panel has her spying the goblin eyes off panel. She then returns to the ball. Maria is on the gondola boat when she sees a servant walk away. A guard blocks the way into her house, says Lord Tyton has fired everyone, and doesn’t recognize her. Tyto is the scientific name for owl which is the shapeshifting form for Jareth in the movie. Albert is busy gathering his things on the floor as Maria climbs through the window. He explains that Napoleon is arriving and will take any Englishman, Count Albert gets angry at Maria. Albert says that Maria is a commoner and that there is no place they can run to, Maria takes off her wig to show her red hair. She points out her child, a boy using chalk to scribble on the floor, the baby Jareth? A Peter Pan who has escaped the Ordinary World to rule the goblins? Back to Venice, Albert says he will send the guard Lorenzo, but Maria doesn’t want him around. We see the stern portrait of Albert’s father as Maria is angry at Albert, gives him a smacking slap, and runs off with the baby. Lorenzo begins chasing Maria and the baby through the night streets. The goblins surround Albert and tempt him with being a king. Maria throws a brick that strikes Lorenzo! Closeup of Albert’s closed eyes who says the goblins can give him nothing, but to take his son! The goblin eyes appear in the shadows and Maria is startled as a hairy arm rocks her gondola and she falls into the water. She wakens in a two page spread on a clock face above a circular labyrinth with a king in dark cloak and crown of antlers. It looks as if this dark lord has an owl face. This is like a mirror of Labyrinth with a stolen child from a girl by a magical ruler. The theft of a child is also told in Franz Shubert’s “Erlkonig.” Jareth brushes off Beetleglum asking if the child is him, but this looks like a great origin story. Five Crystal Spheres out of Five!